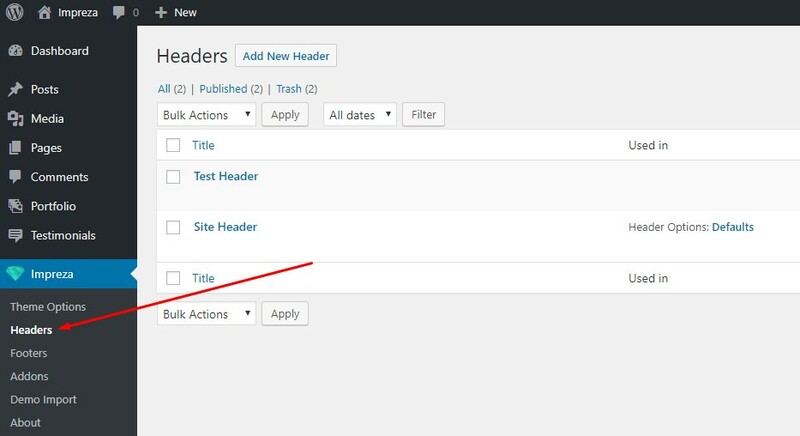 Header Builder addon allows to change website header using visual drag & drop editor. 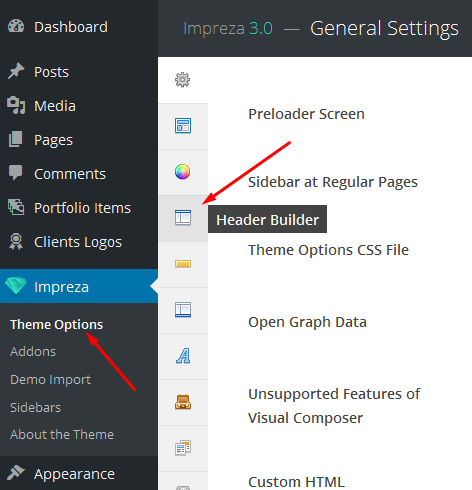 Install it on Impreza > Addons page, when you have activated your theme. The editor consists of 3 rows: Top, Main, Bottom, each with 3 cells: Left, Center, Right. Every row represents website header area, which has its own settings and colors. Top and Bottom areas are optional and can be switched off on the side settings. Every cell represents a container for header elements with the corresponding position, e.g. right cell will display its elements at the right side of your website header. You can move, edit, duplicate or delete every element, hover on added element to see the controls. "Hidden Elements" area is used when you need to hide some element, but keep its settings and content. E.g. when you want to change header appearance on different header states. Header settings affect on the whole header appearance. They are separated on Global Header Settings, Top Area, Main Area and Bottom Area. Header state is a responsive state of a website header, related to the screen width, with adjustable breakpoints. Using header states allows improving header appearance on small screens. The position of Header Elements and Header Settings MAY DIFFER on different header states. When you move any header element on any state, this element won't be moved on other two states. When you change any header setting for any state, these settings won't be changed on other two states. Content and Settings of Header Elements NEVER DIFFER on different header states. When you add a new header element on any state, this element will be added automatically on other two states into the same cell. When you edit any header element on any state, those settings will be changed for other two states too. When you delete any header element on any state, this element will be deleted on other two states. Header template is a predefined layout of a header. Using a header template is a good start to create your own website header. When you apply a header template, your previous header elements and settings will be deleted. 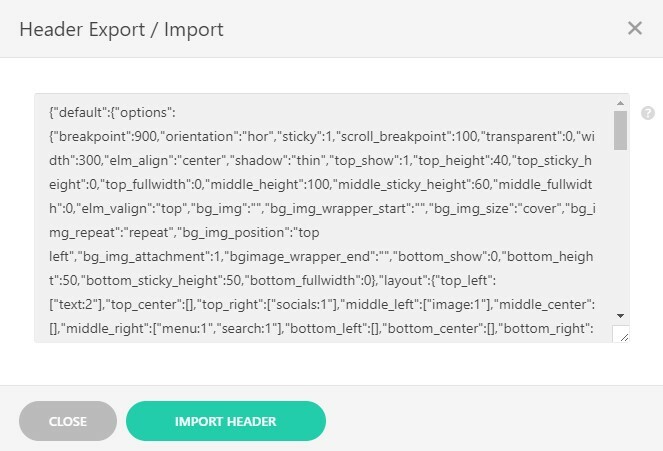 You can Export / Import any header with all its elements and settings. This option can be useful to transfer headers between the sites. Just copy/paste the code into the textarea and click on Import Header button. When you import another header, your previous header elements and settings will be deleted. What is a Header Builder? Header Builder is a unique Impreza addon allowing you to modify website header using visual drag & drop builder. You can install Header Builder at Addons page. You'll be able both to install and to use Header Builder only if your theme is activated. The editor consists of 3 rows (Top, Main, Bottom) with 3 cells (Left, Center, Right) in each. Every row represents website header area, which has its own settings and colors. Top and Bottom areas are optional. Every cell represents a container for header elements with the corresponding position (e.g. right cell will display its elements at the right side of your website header). "HIDDEN ELEMENTS" area is used when you need to hide some element, but keep its settings and content (e.g. when you want to change header appearance on different header states). Header elements are flexible pre-built elements which can be placed into the header. Every header element has its own settings. Text element shows any custom text. You can change its font size (3 cases), apply link, set a custom color and add a custom icon. Also, you can set font source and enable line wrapping. You are able to use <strong>, <br>, <a> tags in the "Text" field. Image element shows any custom image from Media Library. You can change its height (6 cases), apply link, set different image for the transparent header. Main Menu element shows main theme menu, which is set on Menus page. You can place only one Main Menu element into your header. Additional Menu element shows any menu created on Menus page. Additional Menu doesn't show menu sub items, and doesn't highlight active menu items. Search Field element shows search field (surprisingly!). You can change its text placeholder and choose one of 4 field layouts. When WooCommerce plugin is enabled you can also activate "Search in Shop Products only" option. You can place only one Search Field element into your header. Dropdown element shows text link, which displays a dropdown box with links by mouse click on it (or tap on a touch screen). You can change dropdown size (3 cases). Also, you can set Dropdown as languages switcher, it supports WPML plugin. Social Links element shows a list of icons of popular social sites. You can change its size (3 cases), choose basic and hover styles. Button element shows button (surprisingly!). You can choose button style, change button size (3 cases), set custom colors, add a custom icon. Default colors of the button are taken from "Menu Button" color values of Styling options. Cart element is available only if WooCommerce plugin is activated. You can set cart icon and its size. You can place only one Cart element into your header. Custom HTML allows to place any custom code in the header. Added code will be located inside <div class="w-html"></div> element. 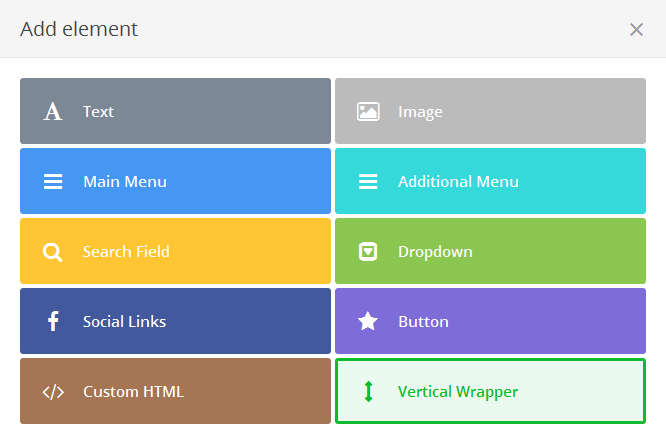 Vertical Wrapper allows locating header elements one above the other in one column, regardless the header orientation. Horizontal Wrapper allows locating header elements in sequence in one row, regardless the header orientation. Header state is a responsive state of website header related to the screen width. Using header states allows improving header appearance on small screens. When you add a new header element on any state, this element will be added automatically on other two states (into the same cell). Header template is a predefined layout of header elements. Using a header template is a good start to create your own website header. When you apply any header template all your current header elements and settings will be wiped.